Clothing, footwear, bedding, furniture, jewelry, beauty products, and housewares. Hecht's, also known as Hecht Brothers, Hecht Bros. and the Hecht Company, was a large chain of department stores that operated mainly in the mid-Atlantic and southern region of the United States. The firm originated in Baltimore, Maryland. By 2005, Hecht's had some 81 stores in 19 markets in Maryland, the District of Columbia, Virginia, North Carolina, Tennessee, Delaware, New Jersey, and Pennsylvania. Its locations in New Jersey, Delaware, and the majority of those in Pennsylvania were operated under the name of Strawbridge's. Hecht's administrative office was in Arlington, Virginia. Hecht's was founded and was operated for over a century (1857–1959) as a family firm. It was purchased in 1959 by The May Department Stores Company which in turn, was acquired by Federated Department Stores on August 30, 2005. On February 1, 2006, Federated dissolved the former May Company divisions, and the existing Hecht's stores were divided between Macy's East and Macy's South, with stores in Delaware, the District of Columbia, Maryland, New Jersey, Pennsylvania, and Northern Virginia going to the former and stores in North Carolina, Tennessee, and the rest of Virginia (roughly much of the former Thalhimers territory) going to the latter. The replacement Hecht's store in Chevy Chase, Maryland, took the Bloomingdale's name. On September 9, 2006 the Hecht's name was phased out in favor of the nationally known Macy's. The Hecht Company was founded in 1857 by Sam Hecht, Jr. The Hecht family was Jewish and came from the little village of Langenschwarz (now part of Burghaun), Kreis Hünfeld, Hesse, Germany where Sam was born on December 10, 1830. His father Meyer (a.k.a. Meier or Maier) Hecht was a cattle dealer or driver who was drowned in Langenschwarz on June 12, 1835. Meyer's parents were Anschel (a.k.a. Anshil or Asher) Hecht who was a fur dealer and Güta (a.k.a. Giet) née Goldschmidt who was born in Bellersheim, Kreis Hungen, Hesse, Germany. Sam's older brother Simeon arrived in America on the ship Agnes on September 2, 1844 listed as Sam Hecht, age 21. Meyer's widow Hannah or Hanne Miriam (née Bachrach) was probably born in Hesse, Germany in 1789 or 1790. She left Germany with Sam and his brother Reuben and immigrated to the United States; they arrived in Baltimore, Maryland on December 15, 1847 on the ship Schiller. Sam's brothers Jacob, Moses and Raphael (a.k.a. Vogel) and sister Adelheid (a.k.a. Ettel or Edel) had arrived in Baltimore on the ship Albert on July 31, 1845 which departed from Bremen, Germany. There may have been another brother Ansel (a.k.a. Asher Ralph) who immigrated to Baltimore but he has not been found on any passenger lists. Asher Ralph appears in Baltimore city directories between 1844–1858; Ansel appears in New York City directories from 1858. Sam Hecht, Jr. became an itinerant peddler selling his goods in and around Baltimore and on the Eastern Shore of the Chesapeake Bay. After a decade of itinerant peddling, he settled down and started what would become the Hecht stores. On Jan 5, 1854 Sam married Babette Wolfsheimer in Baltimore. In 1857 Sam Hecht, Jr. opened a used furniture store on Aliceanna Street (near South Broadway) in Baltimore, Maryland. By 1870 this venture had moved to a more auspicious location at 519 South Broadway where the name 'HECHT'S RELIABLE STORES' could be seen carved in foot-high letters into the granite cornice above the third floor (now demolished). Clothing was added to the lineup in 1879 under the name of Hecht's Reliable. Shortly thereafter a carpet and matting establishment was opened in Baltimore at 310 West Lexington Street. Over the front of the new store on Lexington Street was a sign reading 'Samuel Hecht, Jr. & Sons,' reflecting the development of the firm as a family enterprise. Four of Samuel's sons eventually joined him in business. They were, in order of age: Emanuel (Manny), Albert S., Alexander (Alex), and Moses (Mose) S. Hecht. Emanuel Hecht joined his father in business in 1880. In 1886, he and his brother Albert were listed as partners with their father. Alex and Mose came into the firm later and contributed to its success. Samuel Hecht., Jr. died on February 7, 1907 in Baltimore. His sons, and later his grandsons, carried on the business. The growth of the firm continued in Baltimore with the opening of the Hecht Brothers store on Baltimore and Pine streets in 1885, the Hub store in Baltimore in 1897, and Hecht Brothers at Howard and Franklin streets in 1926. Hecht stores were also established in New York City and Easton, Maryland. There was also a branch in Annapolis, Maryland. 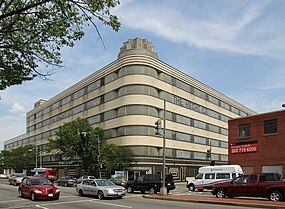 However, the most important move was into Washington, D.C.
Former Hecht's department store located at 7th and F Streets NW in Washington, D.C. from 1924 to the 1980s. The Hechts opened a store in Washington on March 20, 1896, which moved to a grand glass and marble store at the corner of 7th and F Streets Northwest in November 1925. Alexander Hecht directed the Washington part of the business for the family. Hecht's was the first store in Washington to offer national brands. It also boasted the first parking garage and first elevator. Its relatively open policies made it popular among African-Americans as well as the white populace. A tour of Norman Rockwell's Four Freedoms paintings, intended to rally support for the Allied cause in World War II and the purchase of war bonds, premiered at the store in 1943. In July 1951, a mixed race group began to picket outside the store, protesting racial segregation in the store's cafeteria. The offending policy was changed in January of the following year. Hecht's moved its flagship store to a new building in downtown Washington in 1985. The former Hecht Company main building, now across from the Capital One Arena, was extensively renovated and reopened in 2003 as Terrell Place, honoring Mary Church Terrell's role in desegregating that and other public accommodations in Washington. Hecht's operated the last local department store in downtown Washington, in a structure at the corner of 12th and G Streets NW built in 1985 and renovated in 2003. Now a Macy's location as of September 2006, the building has a direct entrance to the Metro Center station of the Washington Metro. After World War II, Hecht Company began to build new stores in the suburbs around Baltimore and Washington. Outside the center of Baltimore, Hecht's opened a store in Northwood in September 1954, followed by another in Edmondson Village in October 1956, and a third in the then-new Reisterstown Road Plaza in January 1962. In 1947 they opened a large three-story department store in Silver Spring, Maryland, just north of Washington, D.C. The wisdom of this move was initially questioned; however, within a few years, more room was needed, and a fourth story was added to the building. That store was closed in 1987 and was converted and expanded into City Place Mall, which opened in 1992 and which is now known as Ellsworth Place. The second suburban store opened on November 2, 1951, at Parkington in Arlington, Virginia. It cost $6.5 million to construct the 300,000-square-foot (28,000 m2) store and it was the largest suburban department store on the east coast at that time. On November 2, 1958, Maryland Gov. Theodore R. McKeldin ceremonially opened the third suburban D.C. Hecht Company store at Prince George's Plaza in Hyattsville. Gov. J. Millard Tawes did the honors on August 29, 1960, when he opened the fourth suburban D.C. location, the 168,000-square-foot (15,600 m2) store at Marlow Heights Shopping Center. The Hecht chain was acquired by the May Company in 1959. At this time, the historic 1924 Bernheim-Leader store on the corner of Howard and Lexington Streets in Baltimore was renamed Hecht's, becoming its flagship store in the Baltimore area. It closed in 1988, one of the last department stores to remain in the downtown district. In 1998, it was declared a city landmark, and has since been renovated into apartments owned by Southern Management. 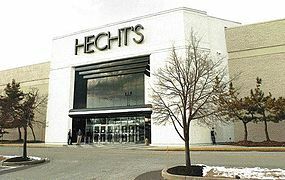 Many other stores acquired later were also rebranded as Hecht's. In 1990, Hecht's acquired four Miller & Rhoads stores in the Washington, D.C. area. That same year, the May company acquired the Thalhimer's chain from Carter Hawley Hale Stores. The following year it was announced that the Thalhimer's stores would be folded under the Hecht's name. When May took over ten Hess's stores, based in Allentown, Pennsylvania, three of them re-opened as Hecht's and the others were operated by corporate siblings Kaufmann's and Filene's. Hecht's acquired Wanamaker's, based in Philadelphia, and Woodward & Lothrop, based in Washington, D.C., taking over 17 stores acquired in 1995 in joint acquisition with JCPenney. Fourteen stores were consolidated the same year. Thirteen of Strawbridge and Clothier's stores, based in the Philadelphia area, were acquired in 1996. Following the acquisition, S&C was renamed Strawbridge's. Their management consolidated with Hecht's the same year, but the Strawbridge name was retained and expanded to all the Philadelphia locations. In the Nashville area, Hecht's took over selected former Castner Knott stores, which had been purchased from East Tennessee–based Proffitt's in 2001. Proffitt's previously acquired them as a result of the Mercantile Stores/Dillard's merger in 1998, and briefly rebranded them as Proffitt's locations. ^ Kelly, Jacques. "Shopping in Fells Point at Hecht's Reliable store," The Baltimore Sun, Friday, August 27, 2010. ^ "Rockwell Show at Hecht Store Biggest War Bond Exhibition," The Washington Post, Apr 25, 1943, p. M5. ^ "Hecht's New Virginia Shop Opens Today," The Washington Post, Nov 2, 1951, p. B1. ^ "3000 See Opening of Hecht's Store at Prince Georges Shopping Center," by Hal Willard, The Washington Post and Times Herald, Nov 4, 1958, p. A16. ^ "Hecht's to Open 5th Area Store," by Frank C. Porter, The Washington Post, Times Herald, Aug 28, 1960, p. B6. ^ Anderson, Jessica; Gantz, Sarah (January 1, 2018). "David Hillman, CEO of Southern Management Corp. and Baltimore-area Developer". Obituaries. The Baltimore Sun. Retrieved August 11, 2018. ^ Gunts, Edward (August 19, 1999). "Bits of Hecht's History for Sale". The Baltimore Sun. Retrieved August 11, 2018. ^ "The Atrium: 118 N. Howard Street, Baltimore, MD 21201". Southern Management. Archived from the original on July 30, 2018. Retrieved August 11, 2018. ^ a b Writer, NEIL CORNISH Staff. "MAY TO BUY THALHIMERS FOR $325 MILLION". dailypress.com. Retrieved 2019-04-17. ^ Potts, Mark (13 November 1991). "15 THALHIMERS TO BE TURNED INTO HECHT STORES". The Washington Post. Archived from the original on 16 April 2019. Retrieved 16 April 2019. Longstreth, Richard W. "The mixed blessings of success: the Hecht Company and department store branch development after World War II," in Hudgins, Carter L. and Cromley, Elizabeth Collins eds., Shaping Communities: Perspectives in Vernacular Architecture, VI: University of Tennessee Press (Knoxville). Originally a 1995 monograph published by the Center for Washington Area Studies at George Washington University. National Association of Colored Women's Clubs: "Washington D.C. Dedicates Terrell Place"
Baltimore's Bygone Department Stores: Many Happy Returns. The History Press. 2012. ISBN 978-1-60949-667-8. This page was last edited on 17 April 2019, at 17:59 (UTC).